Unless you plan to eat out for every meal during your holiday, you will need some groceries – at least for the first day or so. Why not order what you need on-line and arrange for it to be delivered just after you’ve arrived? You can place an order on-line with any one of the following stores to be delivered at a time to suit you. When ordering you will need the full address including postcode of your cottage. You can contact us for that at any time but otherwise it will be provided to you when we send you directions and key code instructions a few weeks before your holiday. Sainsbury’s deliver to most of our holiday cottages in Northumberland – Click here to place an order. Asda delivers to most of our holiday cottages in Northumberland. Click here to place an order. Asda have a policy of using local suppliers where possible, so although they are one of the ‘giants’ of retailing, they do try to still support the local community to a degree. Tesco deliver to most of the locations where are holiday cottages are located. Click here to place an order. The Village Store, located in the centre of the village, although small, sells a good range of all of the essentials like milk, groceries, wine, newspapers, etc. as well as a selection of local produce. The store opens early but closes around 5-5:30pm (varies according to the time of year). This is an interesting, medium-sized market town, home to Alnwick Castle and Garden and the famous Barter Books, where there are many food shops including a large Sainsbury’s, a Morrison’s, Iceland and smaller, independent deli’s, butchers, fruiterers, etc. Alnwick is less than a mile from the A1. A small Co-operative supermarket is located at the top of the high street and a Tesco Express at the bottom, towards the quayside, with smaller independent shops in between. The supermarkets are both open a little later on an evening; the Co-op is open until at least 8pm and Tesco is open from 7am to 11pm 7 days a week. Amble also hosts an interesting Local Sunday Market on the fish quay every Sunday morning, which is worth visiting. Further afield, around 12 miles south of Alnwick, just off the A1 is the lovely, large market town of Morpeth, where a wide range of shops can be found of all kinds, including Morrisons and Marks and Spencer. North of Bamburgh at Berwick, there is a really wide selection of supermarkets, including a Marks and Spencer food, ASDA, Morrisons, Tesco, ALDI and LIDL. If you are celebrating something special on holiday and want to make the most of your cottages instead of going out, why not use a private chef or caterer? Below, we have listed some of our recommended catering companies and private chefs from previous guests experiences. They can cater for picnics, intimate gatherings and private dinner parties. Mouse Straker has over 15 years experience in catering and has a very good team of staff too. Try something a little different whilst on holiday. 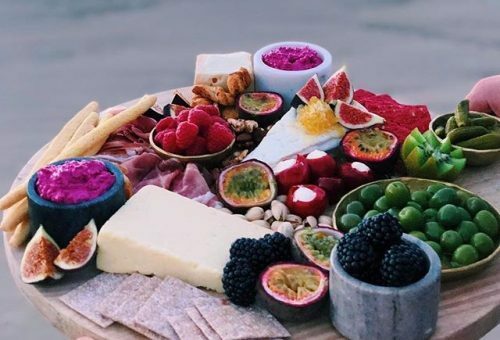 Graze & Gorge offers a true taste of quirky Australasian tasting boards that is oh so instagrammable! You can order your own bespoke platter to be delivered to your cottage, with only the very best local produce used, such as cheeses from Northumberland Cheese Co. and much more. Their aim is to take your celebration to the next level and no event is too big or too small. Don’t forget to let them know you are a Coquet Cottages guest and you will get 10% off! Northumberland produces some of of the finest fish in Britain. From the great salmon rivers of the Tweed in the North and the Tyne in the South. Flat fish, white fish, wild salmon, sea trout, crabs, lobsters, Craster kippers and the only harvested mussels between The Wash and Aberdeen. Oysters are grown within the nature reserve of the Holy Island of Lindisfarne. In addition to this, add the finest Northumbrian cheeses, the freshest vegetables, cakes, ice cream, preserves, puddings and pies and you’ll find Northumberland has possibly the finest range of home-grown, natural and fresh ingredients in Britain. Dine in the cottage or take some home! Please don’t hesitate to contact us with any queries about local supplies of food or other essentials. Telephone: 01665 710 700 or email us your enquiry.